Medellín being surrounded by mountains, we need to reach a col to leave the city. There is nice road going down hills towards the little village La Pintada before to go up hills again in the mountains. The most famous coffee production area in Colombia is located in the triangle made by the cities of Manizales, Pereira and Armenia. The little village Salento is in the heart of this triangle. Salento is a touristic village, also famous for being at the entry of the Cocora Valley where excessively tall palm trees are growing. Salento kept a colonial architecture. On the main square, there is the departure spot of the Jeeps to go trekking in the valley. After crossing the streets with artisans, we can go up hill to reach the mirador for enjoying a panoramic view over the village and the surrounding mountains. 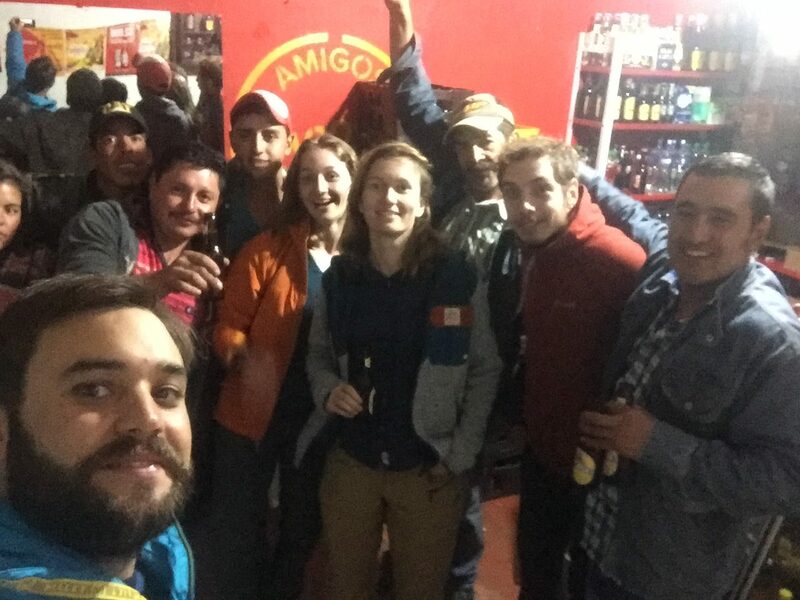 When going back down, we invite you to stop at the bar “Los Amigos” to discover a local game named the Tejo while tasting a craftbeer from the area. Around Salento, there are many coffee farmsnamed “Finca” in the mountainside. There are farms of all sizes and for all tastes. So, do not hesitate to get more information to visit the right one! 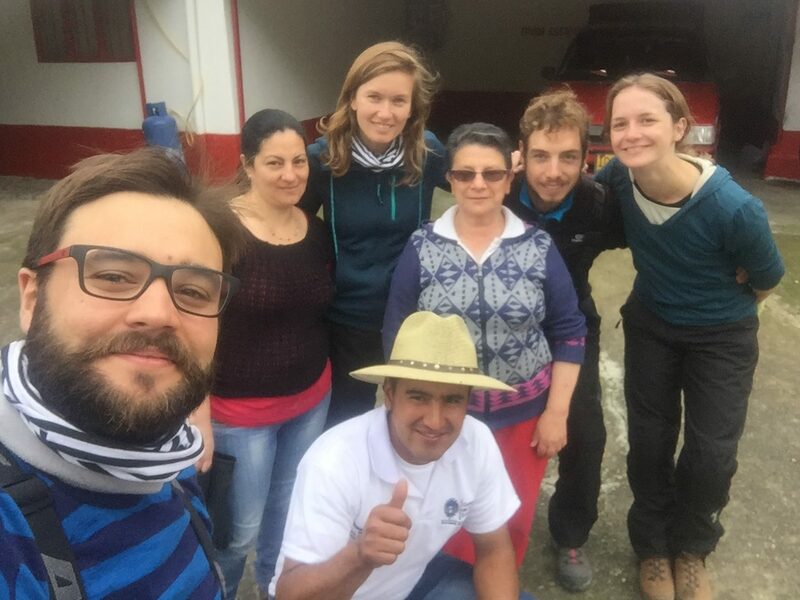 We have opted for the “Finca Acacias”, a small family exploitation where we have discovered, between the coffee plants, the secret of this brown gold before to enjoy a coffee tasting. 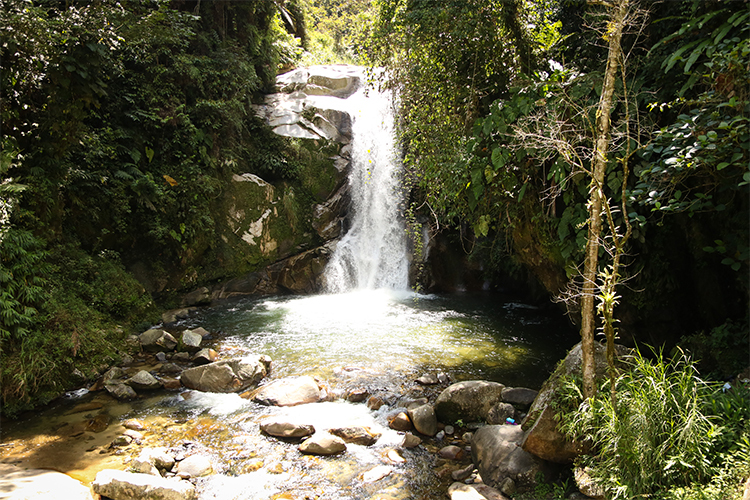 The trekking in the Cocora Valley is a true breath of fresh air, starting with a journey holding the boot of a Jeep. 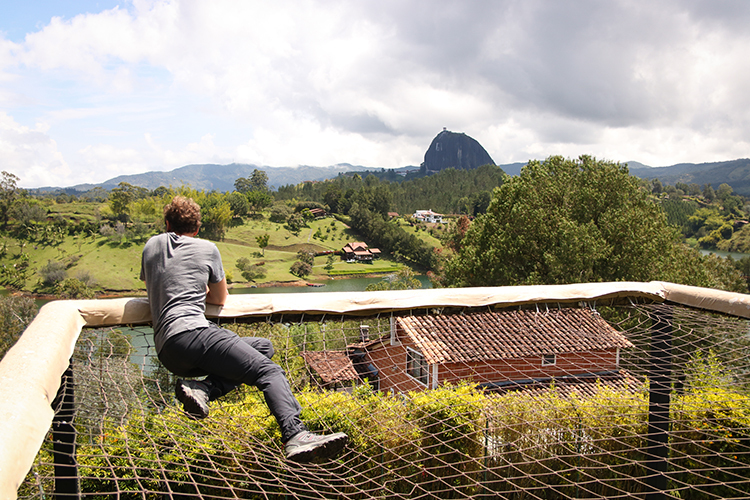 Once arrived at the bottom of the valley, we went up to reach La Casa de los Colibris (the Hummingbird’s House) by crossing many rivers with rope bridges. This houseis reached after a 2 hour climbing. It’s possible to drink a hot chocolate with cheese whilst enjoying the hummingbirdsflying around us. Once relaxed, we climbed again to reach the second refuge, the highest point of this hike. Then, there is a nice slope until the starting point, in the middle of the huge palm trees named wax palm trees are impressive with their 70m high! 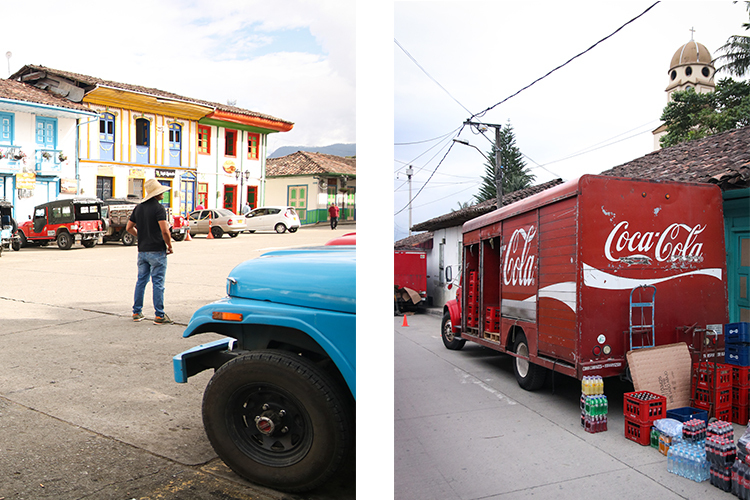 We carried on our journey on the Pan-American Highway and we reached Popayan. This Colombian city is also named the “White City”. The historic town Centre kept its colonial architecture with white-frontage houses. Churches are indeed numerous in Colombia but they are one at each corner of this city. They have the specificity to be colourful and to have altars with beautiful gildings. 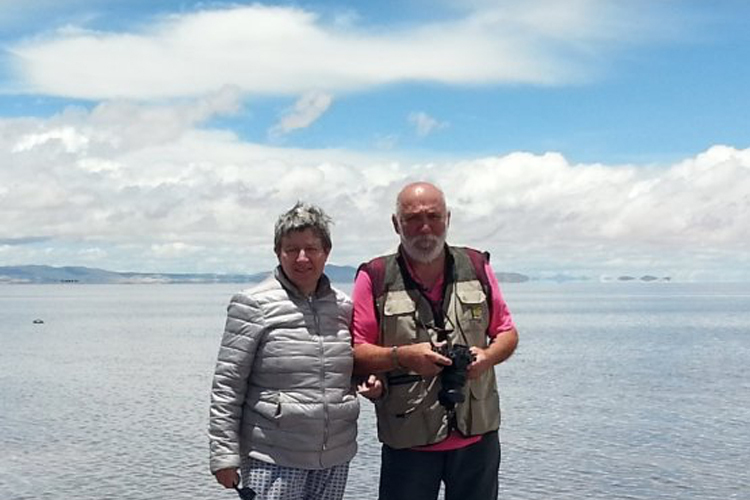 Just before the Ecuadorian border, we did a stop in Ipiales. The city is a bit austere but located on a strategic point. The border is only 10kms away towards South. 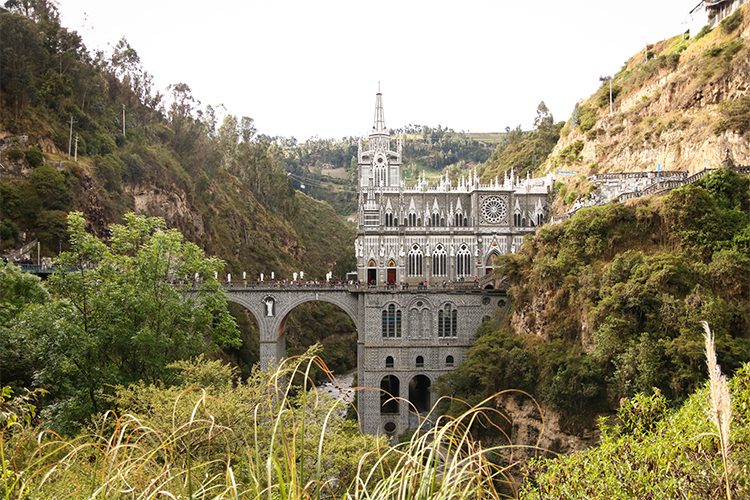 In addition, 7kms away towards East, there is the sanctuary of “Las Lajas”. This is a beautiful basilica built in the heart of a canyon. The first religious building dates back to the middle of the 18th Century and was built after the discovery of a painting on the rock showing the Virgin Marie holding Jesus in her arms. This building has been increased over centuries to create a majestic basilica which has been finalised in 1953. 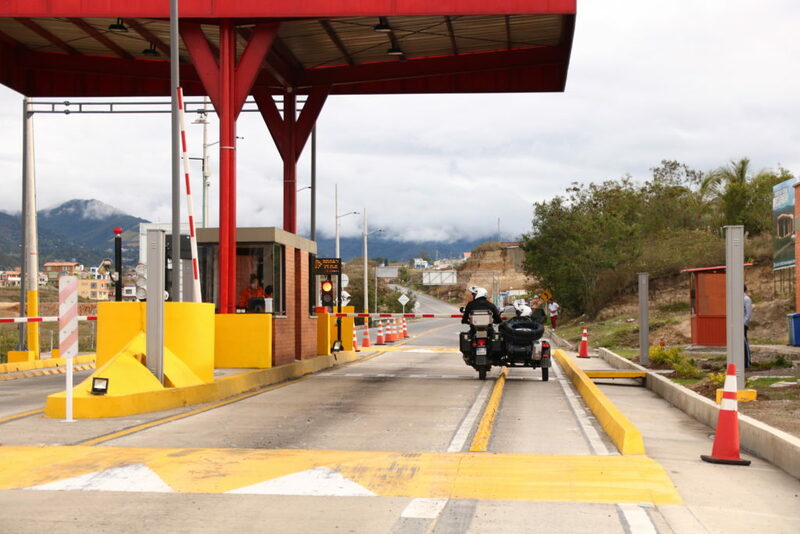 The next day, we left Ipiales at the dawn as we wanted to cross the border the quickest possible. We arrived at the border at 7am but many Venezuelans were already in the queue. Travelers that we met on the road told us about this, and indeed it’s very hard not having any feelings about this situation. They are waiting patiently and don’t saying anything when they see Europeans passing in front of them as there is a specific line for European citizens. We managed in less than an hour to get the stamps proving that we left the Colombian territory. Plus, gave back our temporary Colombian importation document for the sidecars (only 5mins for this). 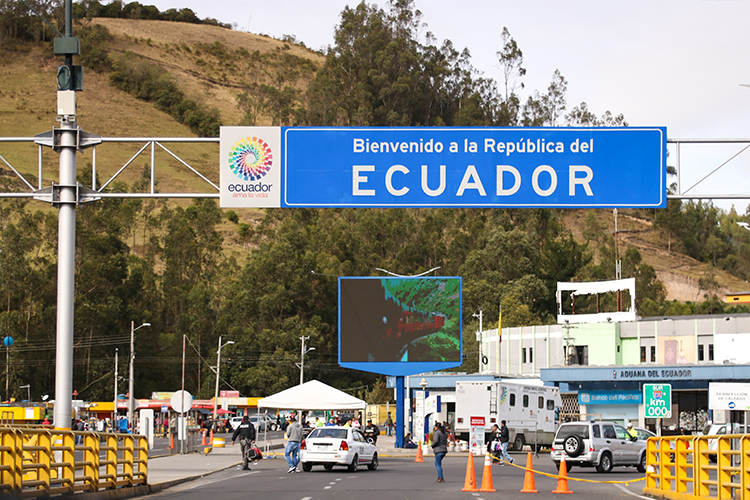 Then, we crossed the bridge separating both countries before to go to the Ecuadorian immigration desk to get our visas for the next 90 days. Here again, in only 5 mins we got our stamps for the visas. We needed a few more minutes for the importation of the sidecars. Overall, crossing this border took us 2 little hours. All the paperwork have been done by a nice and smiley staff. Let’s go to Ecuador for our next adventures! 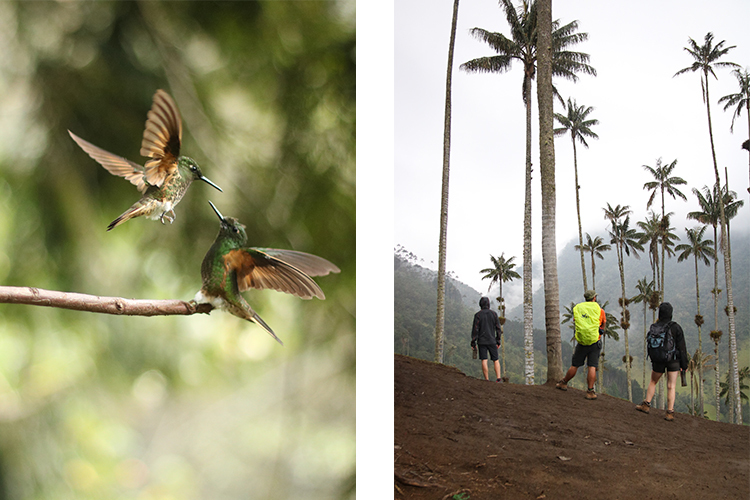 We won’t hide it from you too long… if you wish to visit the Hummingbird’s House, you will need to make a small detour of 2 kms during your hike in the Cocora valley. But this additional is well worth the effort to worn your shoes a little bit more! First, because a drink is included in the price of the ticket and enjoying a hot chocolate (you can opt for El chocolate con queso – which is a Colombian speciality!) for a break during the hike is great! But above all, watching the show offered by the hummingbirds flying around is impressive! With their trajectory, their high speed and when they are hovering over to. We could stay hours. A delicious moment for eyes and taste buds. This is maybe not the most beautiful, the biggest or the easiest to access but we recommend this “finca” without a doubt as we have been very well-welcomed. This visit has been done in a simple way but in a good and communicative mood with the wish to share a passion more than a job. A true moment of sharing which ended with the tasting of a treasure: a Colombian coffee! This is an enjoyable place where to eat the local dish which is the trout named here “Trucha.” The place and the staff are nice, and for the most important: the garlic trout is delicious! The only bad point is the price which is still accessible but expensive, probably due to the city being very touristic. We still highly recommend it! 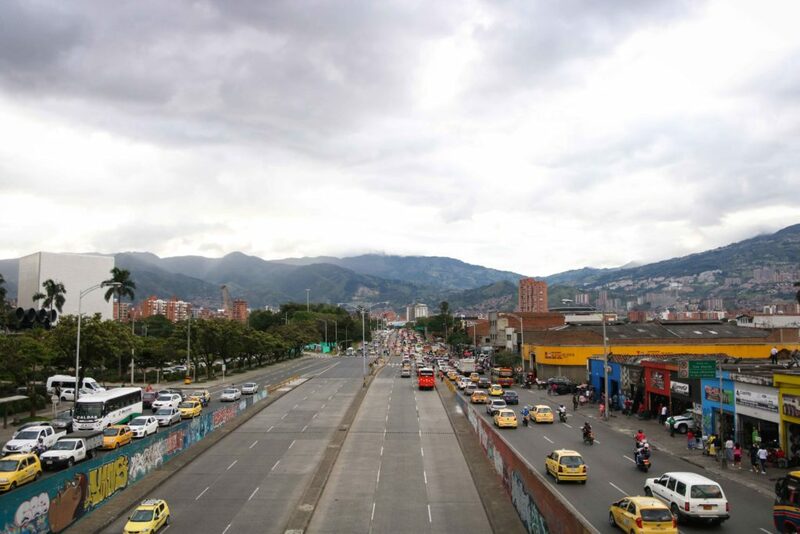 Arriving in Medellín, we understood quickly the impressive size of the city. Some new areas, with houses made randomly, are being built in the surrounding mountains. Effectively, Medellín is the second most populated city in Colombia. This city is sadly famous in the world for the bloody crimes which happened from the 70’s to the 90’s. The drug cartel of the famous Pablo Escobar imposed his law which causes many score settling. Step by step, the local associations with the help of the public authorities have successfully integrated the street art and the urban culture to replace the acts of violence and delinquency. The “Comuna 13” area is today the standard-bearer of this successful transition. Adding escalators in this area helped to open up the hill. Plus, painting graffitis on the majority of the walls helped to attract today many tourists who like this urban culture. The historic town centre has 2 nice squares. The Botero Park highlighting the sculptures of the famous artist around the cathedral. The Plaza Mayor having a modern architecture and away of the traffic. This is an enjoyable and quite spot, hidden from the buzzing life of the city, but locals do not seem to come here a lot. The Parque Lleras area is very westernised. 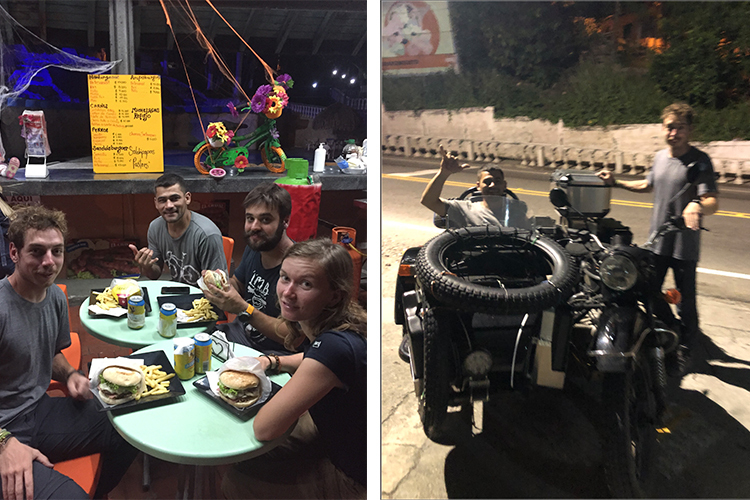 There are restaurants and bars with worldwide influences where we can meet backpackers and comfortably off Colombians. 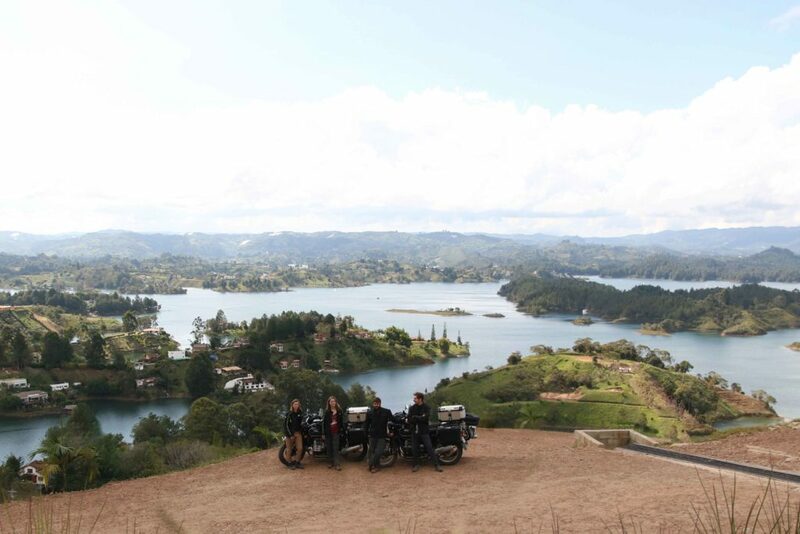 1h30 away by riding, towards East, the lagoon and the Guatapé village is not to be missed. Indeed, you will see many tourists, but the surroundings is largely worth it! First, the village offers a surprising colour palette. Each facade of the houses has a embossed fresque with on the lower part with a design of animals, jobs or geographic places. 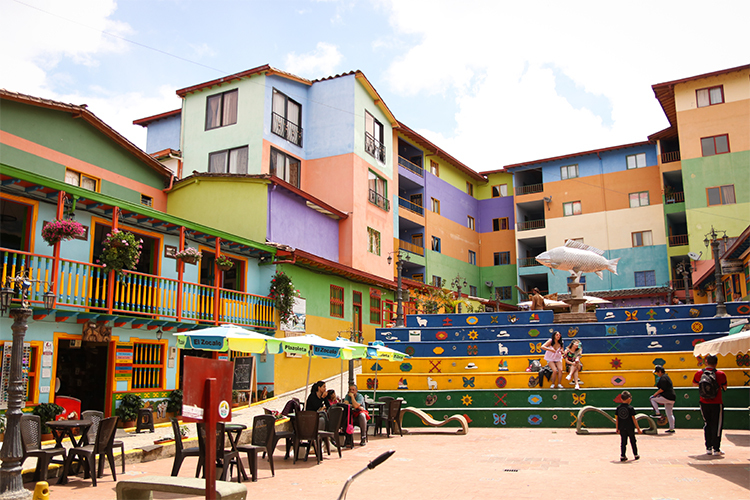 The “Plazoleta de los Zocalos” has stairs painted with hundreds of colours. If the weather is nice, this place is perfect for a “tinto” coffee on a terrace. During our passage, roadworks were in progress to build in the future the banks of the lagoon which will increase again the beauty of this village. A few kilometers away, you can’t miss “Le Peñón”. 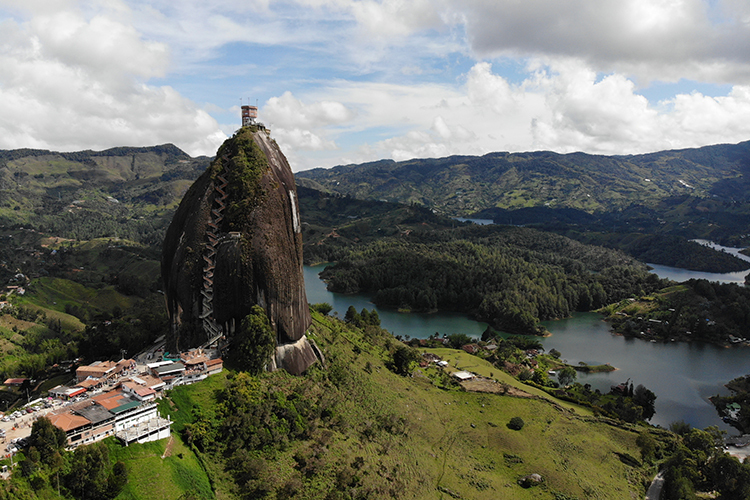 This rock, famous in the world, offers breathtaking view over the lagoon after climbing its 659 steps. The lagoon, and its nuances from blue to green with a hint of turquoise, is artificial. Indeed, the lagoon has been created further the construction of a river dam to create a reservoir provinding freshwater to Medellín. To conclude this stage, we spent the night next to the lagoon. A waterfront waking up to enjoy a last time this memorable place before to go back on the road towards the South. Arepas are nice but after a month, a pizza is like a dream. 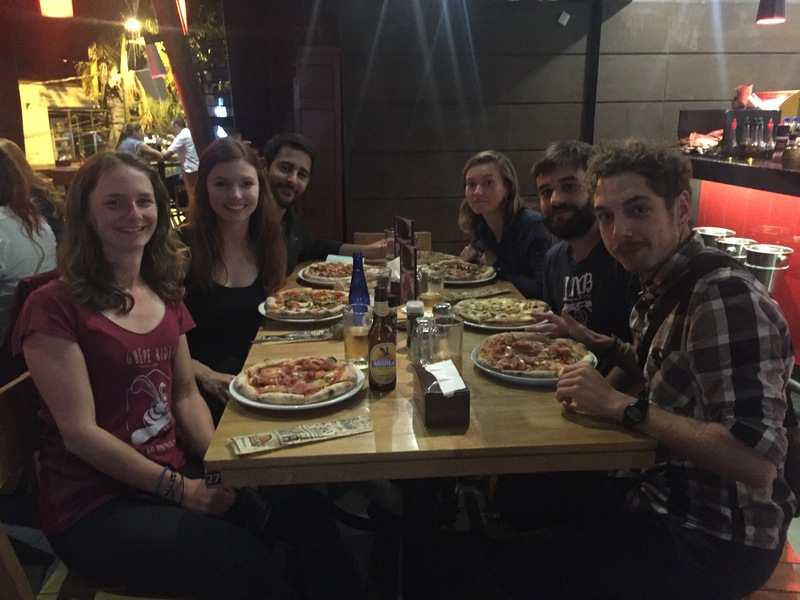 We recommend to the backpackers having the same feeling, to enjoy the Pizzeria Il Forno. This pizzeria is located in the Parque Lleras area which means prices are a bit high, but this crunchy pizza dough… this delicious tomato sauce base… this melting mozzarella… well… we couldn’t resist! 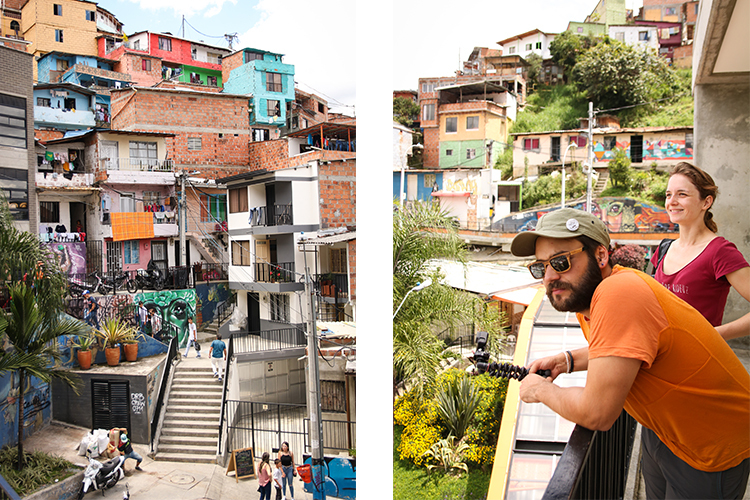 We have been impressed by the Comuna 13 area, but you need to climb up. In spite of taking the escalators, you will feel thirsty quickly… No worries as Luis is here with his fabulous fruit juices. A simple terrace but a reasonable price in spite of its optimal location to attract tourists. This juice deserves at least a little break of 15 minutes. 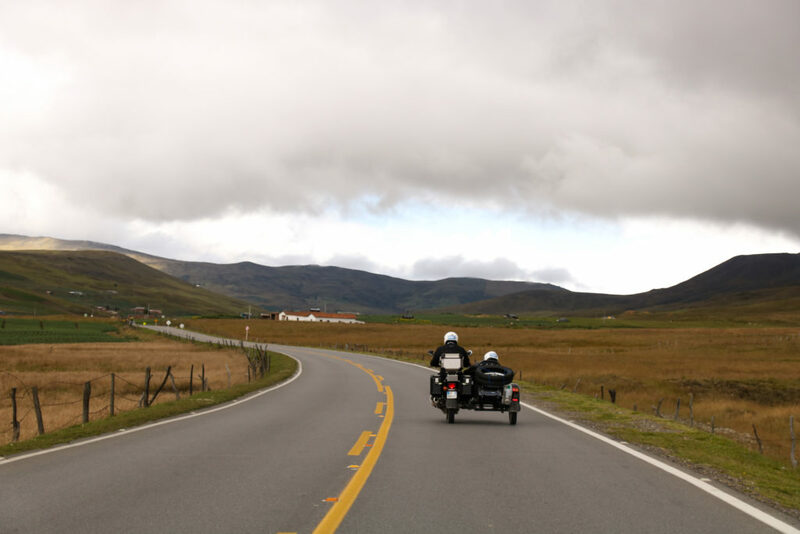 12 days after our arrival in Bogota and 8 days after landing at the Rafael Nunez airport in Cartagena, we are leaving the Bolivar department by riding our sidecars towards Pamplona, next to the Venezuelan border. The journey has been full of experiences and deserve a few lines! First, as soon as we left the port we needed to find some petrol. It can be an easy task but at the first service station we didn’t expect to see the prices in COP per gallon (COP = Colombian Pesos) rather than in COP per litre. It’s around 9,000COP/Gallon which means 1€/litre. 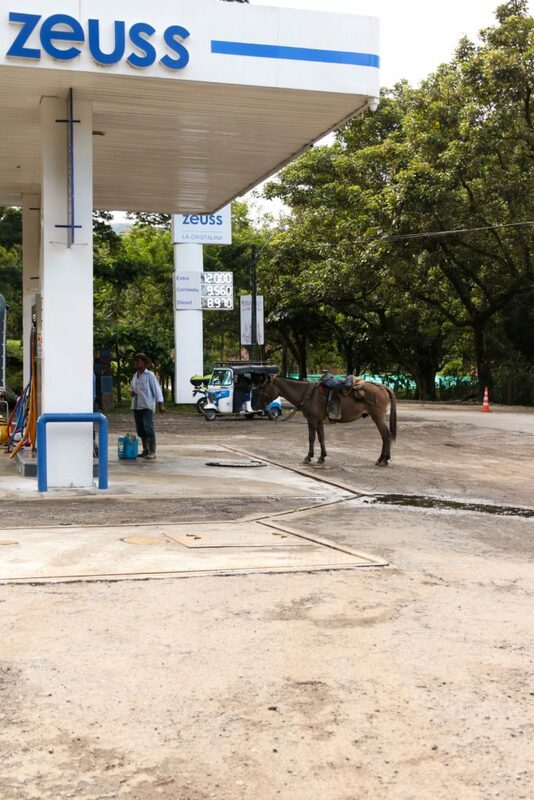 The second new thing is that a petrol pump attendant will full your vehicle. Always kind people, they often asked us many questions about our trip and some of them will ask to take some photos. We haven’t had any issue to find a service station later during our trip as there are usually no more than 40kms between two service stations. During the first kilometres, we also needed to get familiar with the signs. Excepting the one for the full and low beams, most of the signs are similar to the European ones. We just needed to do some researches for the signs with Spanish wording such as the ones for roadworks and second itineraries. The speed limits are less high compared to the French ones, particularly the highways as the speed limit is 100km/h. However, for locals this speed limit seems only informative! 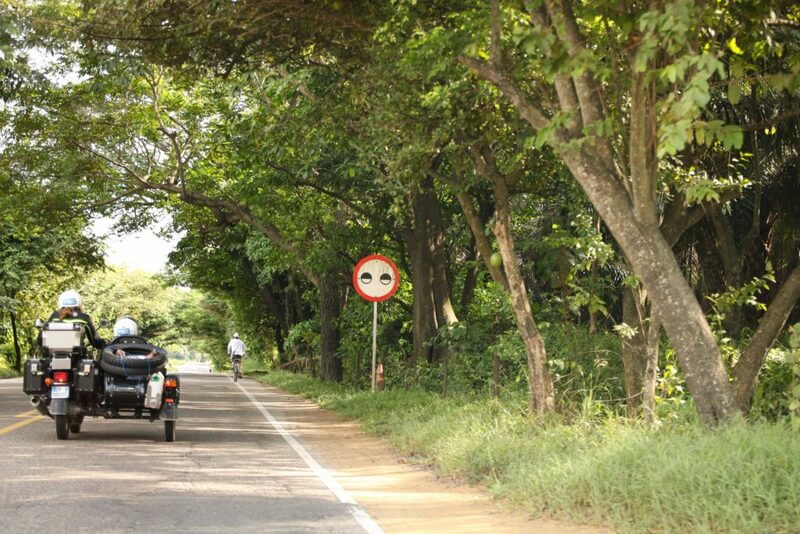 Wearing helmets and suitable clothing doesn’t seem to be an obligation either for Colombians. The most surprising is to see 6 people in a car or a family of 4 people on a motorbike, which is actually something usual for them. The roads that we used are mainly the major roads. These ones also named “autopista” are very different compared to the quality of the French ones. First, because the highway is not necessarily a four-lane motorway. Plus, usually these roads cross villages. In addition, the quality of the road surface is not that great. We often needed to slalom between the potholes in spite of the several roadworks. Patience is key here as sometimes the road can be closed for 30mins. 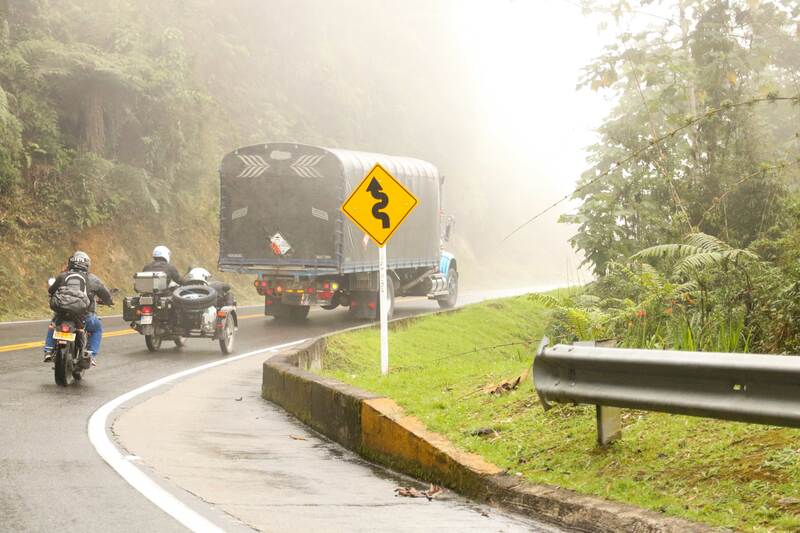 The road construction is financed by the Colombian government. Their maintenance, safety and first aids are hold by private concessionaires. These concessionaires are financed by the tolls they are installing. However, the tolls are free for the motorbikes. To avoid paying, motorbikes need to take a narrow path on the right hand side. With our three wheels, it has not been always easy to go through! When it’s not possible, we needed to negotiate with the agent to open the gate which sometimes was starting an alarm. During this first trip, we realised how much mountains there are in this country. The North of the Andes Mountains offers beautiful landscapes and nice zigzags. We enjoyed going in the curves and changing of speed until getting stuck behind a « tractomula », these big trucks with an American design bringing containers on the top of the summit at less than 20km/h. The road is highly frequented by trucks. For cars, we have been impressed by how famous is the Renault French brand in the country, as much as brand new cars and old cars. This notoriety is justified by the presence of a Renault factory in Medellín. 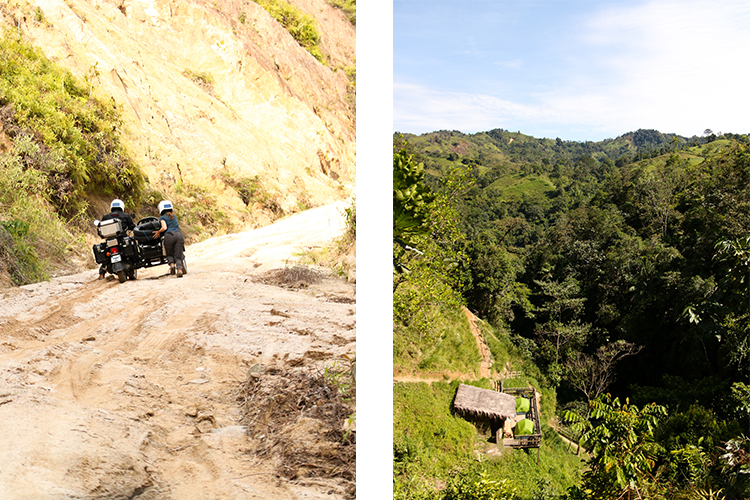 In Colombia, the queen on the road is the motorbike with preferably a small engine capacity. They can go up any steep road and go in the narrow roads when there are a lot of traffic. This choice for the 2 wheels reinforced their curiosity for our sidecars when they saw us. For them, these vehicles exist only in the historic movies about the 2nd World War. Bicycles are also famous in Colombia. We were impressed by the numbers of bicycles and their quality. Once arrived on the secondary roads, the passion for pedaling is still there. 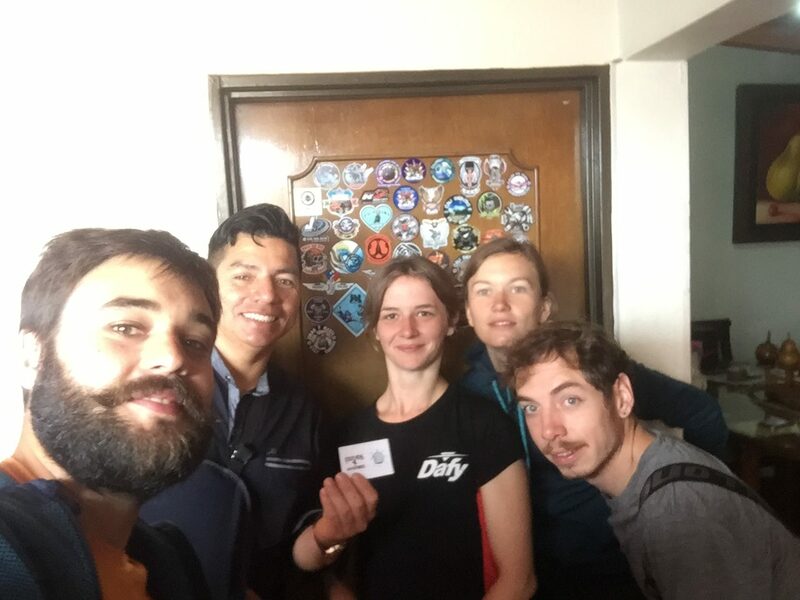 Many bikers wear the official top of professional teams while going up summits of the Andes, and some of the youngest might be one of the competitors pedalling one day on the French Alpes summits. Bicycles are also famous in Colombia. We were impressed by the numbers of bikes and their quality. Once arrived on the secondary roads, the passion for pedaling is still there. 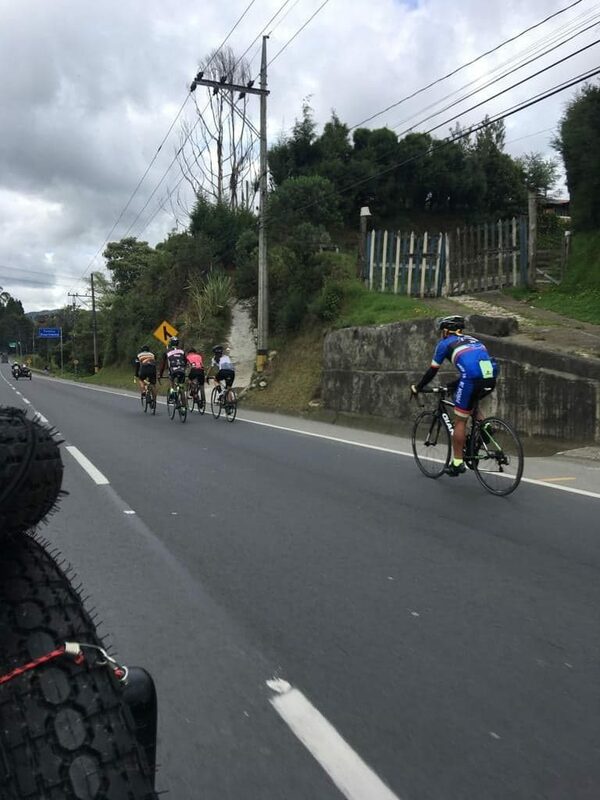 Many bikers wear the official top of professional teams while going up summits of the Andes, and some of the youngest might be one of the competitors pedaling on the French Alpes summits. 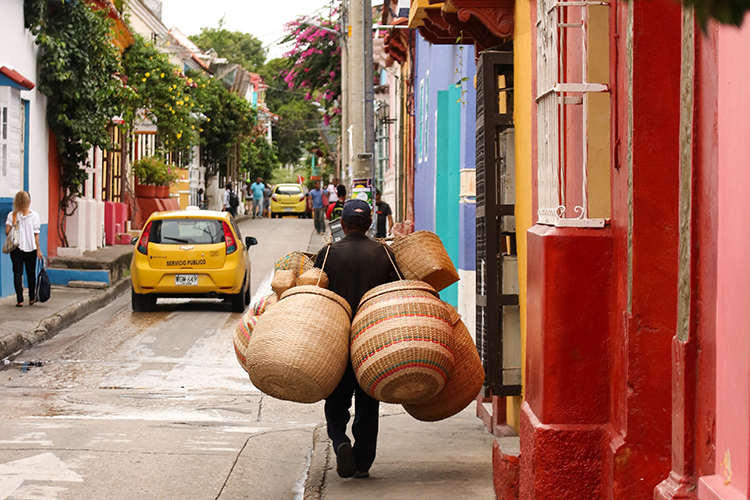 The main roads in Colombia are economic stakes in the villages and cities they cross. Each beginning of village is signaled with a speed bump. At each one, there are vendors to offer cold drinks, fruits and snacks to drivers of cars and trucks. The second symbol of these villages crossed by highways is the presence of many restaurants. We do not know if this is to attract customers or if it’s to be heard over the neighbour’s music but for sure their speakers make latino music with a loudly volume. It’s not rare to see on main roads some painted marks to signalise schools while there is no sign of a village around. For most of the villages in the mountains or at the bottom of the valley, schools have been built near the only closest main road. On the road, there are many control points. Usually, policemen are checking the vehicle documents. We had barely a couple of « serious » checks by the police. 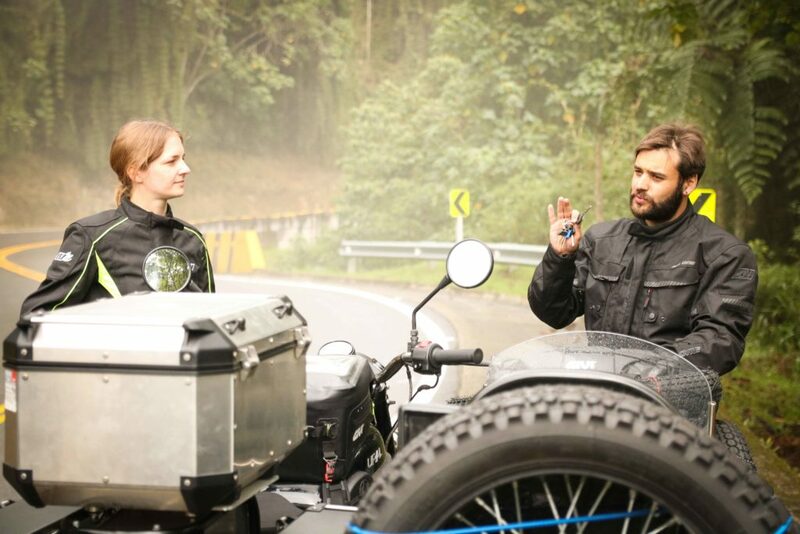 Usually, they asked us to stop to learn more details about the Ural sidecars. The inspection ends with a photoshoot and a nice hand check. This trip in side-cars allow us as well to enjoy odours. This is usually the smell of the fresh cut grass by the concessionaire agent, rain on the tarmac in mountains, or the sugar cane just harvested. But it’s also the smell of petrol and exhaust when we become closer to urban areas! After a few days on the road, we had our first habits. Journey of about 150kms with a change of rider half way through. We spend an average of 4 hours per day to ride. The passenger in the side indicate the directions with the sat nav applications such as “Maps.Me” or “Here” depending on the preferences of each one. The passenger enjoys the road, takes sometimes a few photos and progresses on the writing of blog articles! Both teams can communicate by walkie-talkies, used for the necessity of petrol or a break. This is with these words that we mark this first experience on the Colombian tarmac. The beginning of an adventure on the roads in the world! We arrived in Cartagena on a Sunday night to finalise the importation of our sidecars in Colombia. This administrative task took a while but we still had time to enjoy the colorful streets of this pretty city. 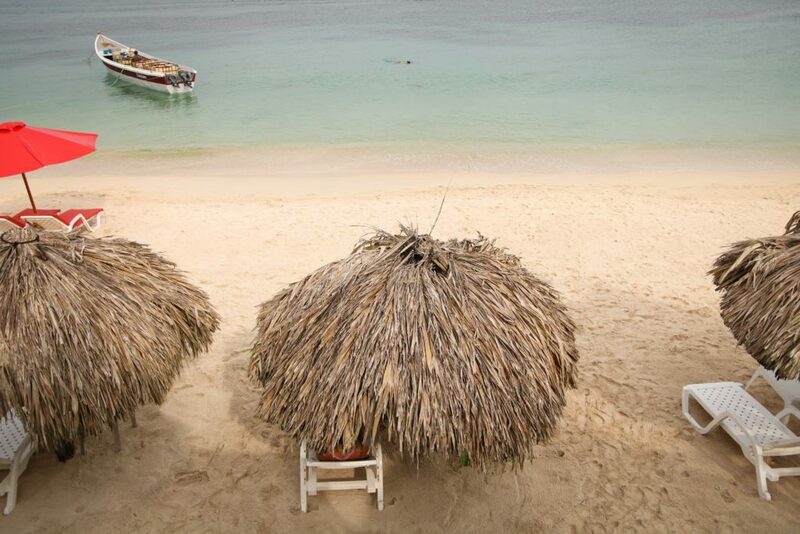 Situated on the Caribbean Coast, the weather in September is warm (30°C) and humid (80%). The historic centre is fortified with pretty colorful streets giving the opportunity of strolling along in a Spanish atmosphere. 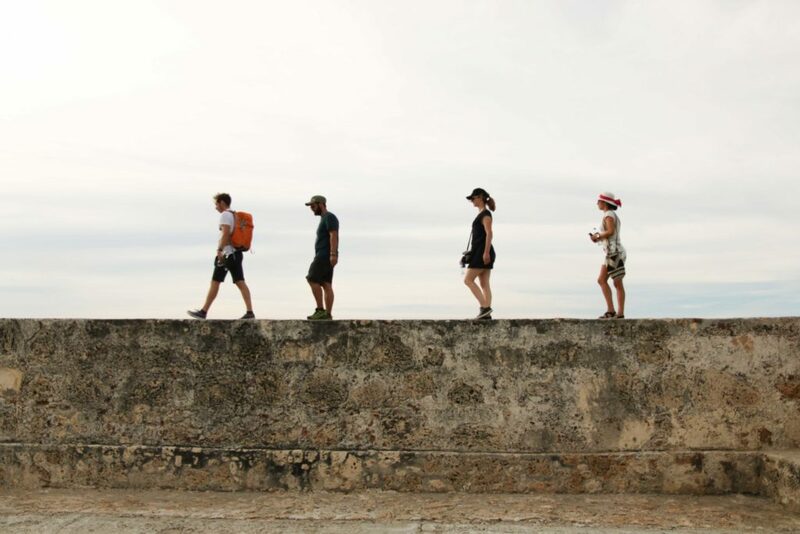 Indeed, by walking around the port, the different places or the fortifications, we can notice the Spanish conquistador influences. At midday, after walking all the day, it’s time for a lunch break. We discover the pleasure to taste the “Menu del Dia”, offered in the most of restaurants. This menu includes a soup and a main dish for a very reasonable price (around 15,000 COP which means 4,5€). 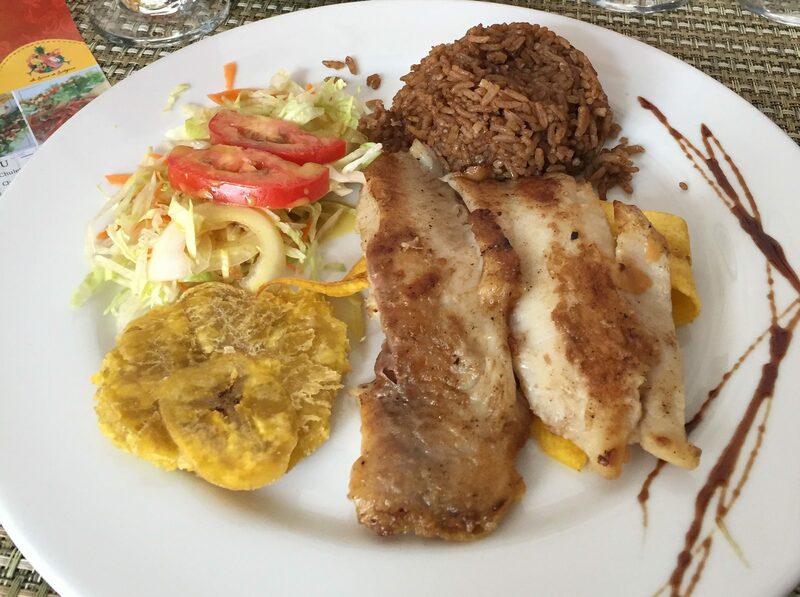 This menu highlights the local speciality which is the asado fish (fish cooked on the bbq). A delight! As the sidecar import has been longer than we thought and as Cartegena had no more secrets for us, we decided to go to Isla de Barú and more specifically its “Playa Blanca”. This beautiful beach with white sand is crowded by the tourists between 11h30 and 15h30 (slot times for the boats coming from Cartagena). Nevertheless, the landscape is as beautiful as a photo on a postcard. The sea has a gorgeous turquoise colour and is as warm as a bath! 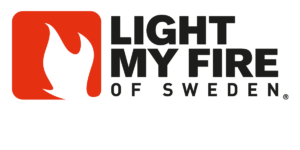 This is a worthwhile experience but only if you can stay overnight. You can enjoy the quite beach at the dusk and a lonely swim in the sea when you wake up. 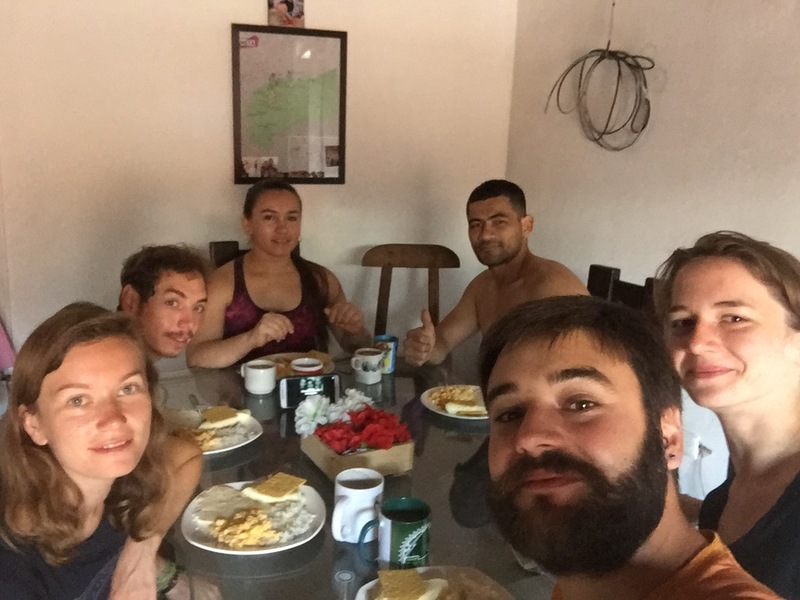 This experience allow us to enjoy the simple life with no internet connection, in very basic hotels with no running water and electricity during daylight due to the geographic constraints. After spending 2 days with sandy feet, it’s time to hit the road! Hands on the handlebars and helmet on the head, let’s go to Pamplona which is a city next to the Venezuelan border. A youth hostel, 500m away from the clock tower next to the pretty Trinity Place which becomes full of lights at the dusk. The hostel is nice and colourful like the city. The pool is enjoyable after a good touristic day in the sunshine and the staff will do everything they can to help you. A restaurant in the historic town centre with an enjoyable courtyard. . The menu offers many fish options including the “Menu del Día” for an affordable price. A restaurant next to the Trinity place which doesn’t seem attractive but there is a pretty courtyard and a very welcoming staff. We opted for their nice “Menu del Día” which includes a fish or cheese soup and a fish dish.